The crew of Skidaway Institute of Oceanography’s Research Vessel Savannah has been honored with the Gold Award in the Chancellor’s Customer Service Recognition Awards. The crew won the award in the team category in a competition among all 36 institutions in the University System of Georgia for year ending June 30, 2012. 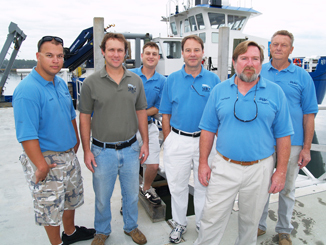 The crew of the R/V Savannah, (l-r) Chris Keene, John Bichy, Pete Casserleigh, Michael Richter, Raymond Sweatte and Richard Huguley. The 92-foot, ocean-going R/V Savannah is used by scientists from Skidaway Institute as well as other institutions for oceanographic research in waters ranging from Cape Hatteras to the Gulf of Mexico. The award was based on a survey of scientist-customers in which R/V Savannah crew received outstanding reviews. In the two key categories that dealt directly with the crew and their interaction with the science parties, the scientists rated the crew with an average of 4.97 on a scale of one to five. The crew received the award in a ceremony at Clayton State University on October 4th. The team is led by Captain Raymond Sweatte, and includes First Mate Peter Casserleigh, Engineer Richard Huguley, Second Mate Chris Keene and Marine Technician John Bitchy. They are supported by Marine Superintendent Michael Richter. The Skidaway Institute of Oceanography is currently seeking applications for two faculty positions. Trace Element Geochemist – This is a faculty position at the Assistant Professor level in trace element geochemistry. Applications from more senior candidates will also be considered. The successful candidate must have a Ph.D. and is expected to develop an active, extramurally funded research program. We are particularly interested in a collaborative colleague who can demonstrate experience in conducting field-based, interdisciplinary research in estuarine, coastal and/or marine environments. Marine Environmental Chemist – This is a faculty position at the Assistant Professor level in environmental chemistry, with interest in organic contaminant chemistry in the marine environment. Applications from more senior candidates will also be considered. The successful candidate must have a Ph.D. and is expected to develop an active, extramurally funded research program. We are particularly interested in a collaborative colleague who can demonstrate experience in conducting field-based, interdisciplinary research in estuarine, coastal and/or marine environments.